Australia’s first commemorative note - issued for only one year! Unique! Carries commemorative '26 January 1988' overprint! Marking the 200th anniversary of European Settlement, the 1988 $10 Bicentennial Polymer Banknote was Australia's first commemorative banknote. Importantly, it was also the world's first polymer banknote. One of the greatest landmarks in Australian currency history, as the culmination of 20 years of work by the Reserve Bank of Australia and the CSIRO, the successful introduction of the world's first polymer note would prove the trigger for a global currency revolution. Today, more than 30 countries around the globe have turned to safer, cleaner, more durable polymer banknotes. 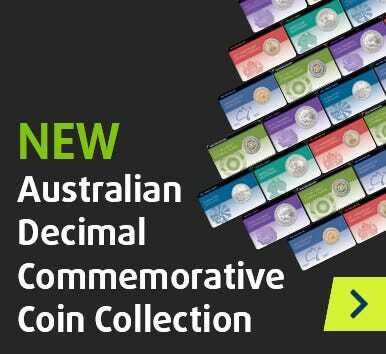 An absolute must-have for any and every Australian collection, this is your chance to secure the 1988 $10 Bicentennial Commemorative Overprint Issue! Distinguished from the standard note by virtue of the '26 January 1988' overprint, and carrying a 'AA' serial number prefix, this key note is offered in strictly Uncirculated condition,Presented in the original Reserve Bank of Australia folder of issue, this crucially important Australian legal tender issue is surprisingly affordable at our price.